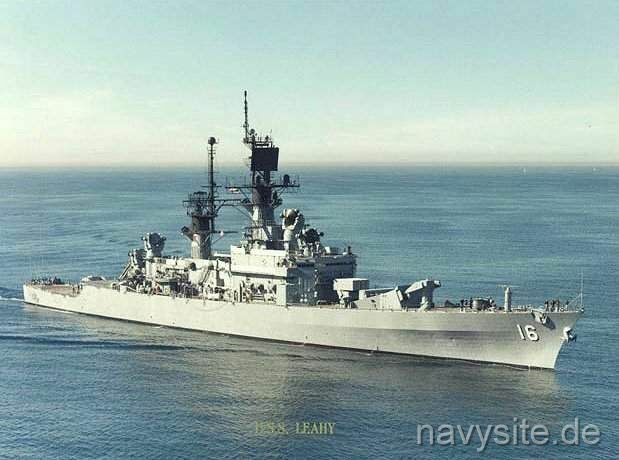 USS LEAHY was the lead ship of the LEAHY-class of guided missile cruisers and the first ship in the Navy named after Fleet Admiral William D. Leahy. Stricken from the Navy list on October 1, 1993, LEAHY was subsequently laid up at Benicia, CA, as part of the Suisun Bay Reserve Fleet. LEAHY was later sold to International Shipbreaking Corp., Brownsville, Tx., for scrapping. This section contains the names of sailors who served aboard USS LEAHY. It is no official listing but contains the names of sailors who submitted their information. 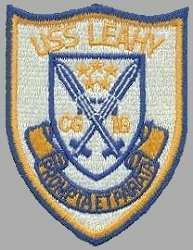 Click here to see which USS LEAHY memorabilia are currently for sale on ebay. 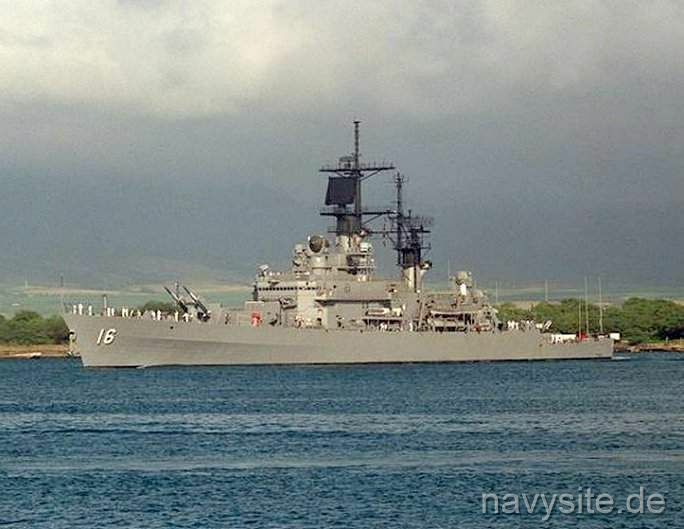 Built by Bath Iron Works in Bath, Maine, USS LEAHY was the first of its class of nine guided missile cruisers. The keel was laid December 3, 1959, and LEAHY was commissioned August 4, 1962 at Boston Naval Shipyard. After completing a shakedown cruise, she reported to her first homeport of Charleston, South Carolina. LEAHY made two six-month deployments to the Mediterranean Sea during the next three years. 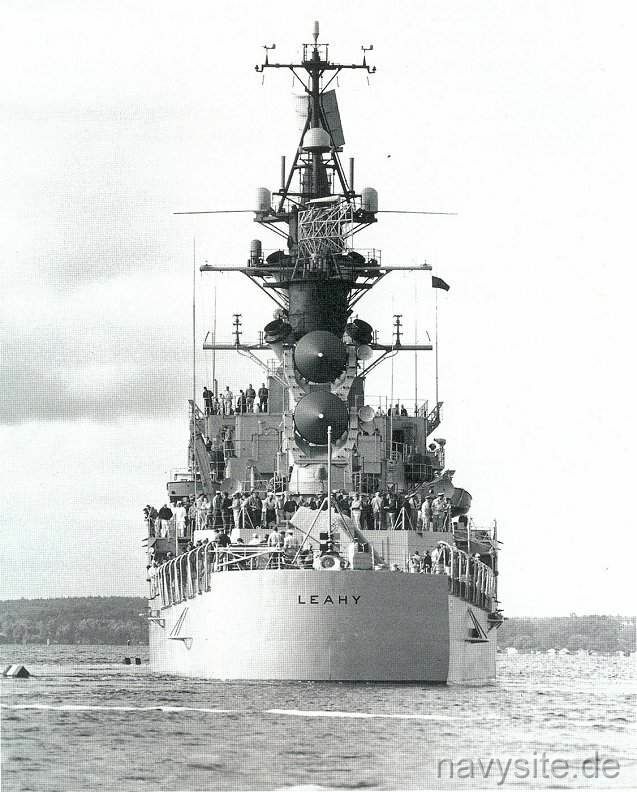 Leahy was decommissioned in February 1967 at the Naval Shipyard in Philadelphia for a complete modernization package. The Naval Tactical Data System (NTDS) and associated radars were installed, giving her the most up-to-date computerized weapons systems in the fleet at that time. 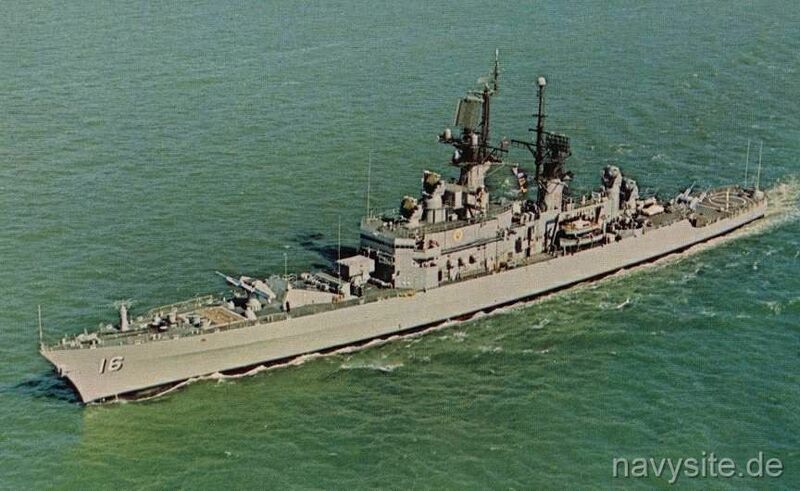 LEAHY was then recommissioned in May 1968 and reported in August to her new homeport of Norfolk, Virginia. Within the next six years she made four more deployments to the Mediterranean. During this period, she underwent a major overhaul at the Norfolk Naval Shipyard. 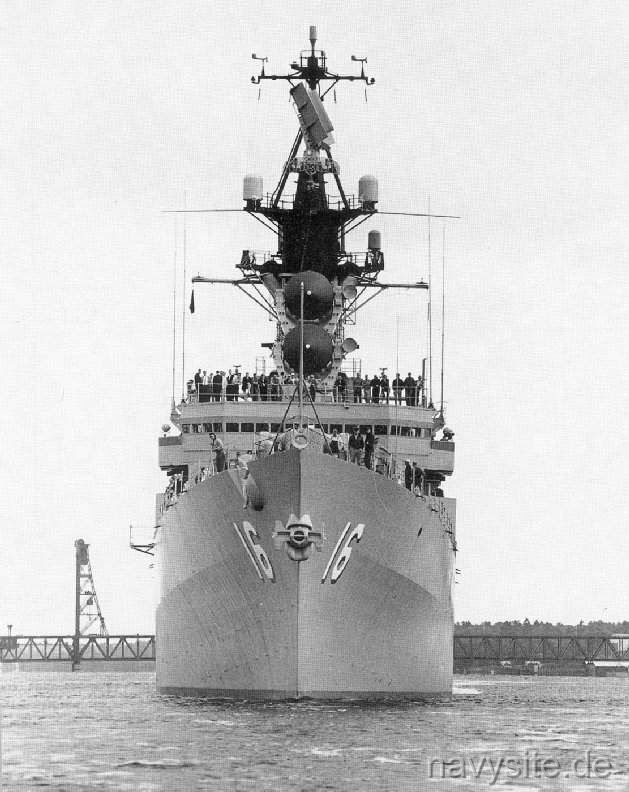 On May 12, 1975, shortly before her sixth Mediterranean cruise, LEAHY became the first U.S. warship to visit Leningrad, Russia since the early 1860's and the first U.S. warship to visit the Soviet Union since World War II. In all, more than 12,300 Soviet visitors toured LEAHY during her five day visit. 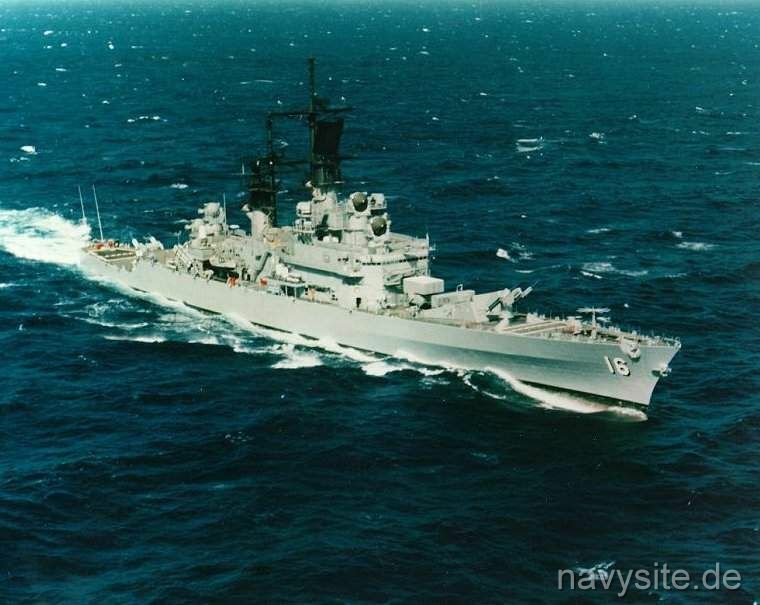 After completing her Mediterranean deployment in October 1975, LEAHY steamed through the Panama Canal to her new Pacific Fleet homeport of San Diego, California. 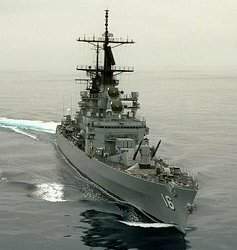 After participating in various fleet exercises off the west coast, LEAHY entered Long Beach Naval Shipyard in September 1976 to begin a year-long overhaul. During her 12 months in the yards, LEAHY received many improvements and modifications in her fire control system, engineering plant, communications system and other areas, designed to assure her of being a fleet AAW leader for another five years. 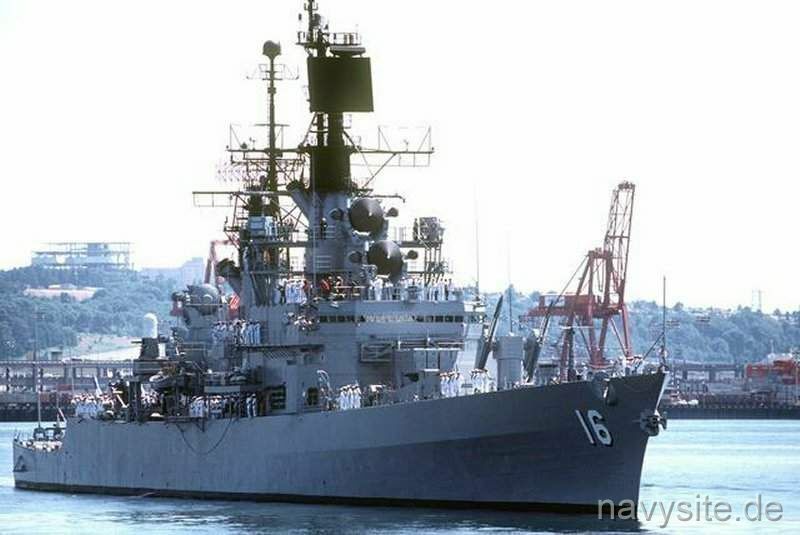 She completed her first Western Pacific deployment in February 1979 and has since completed a total of eight Pacific and Indian Ocean Deployments. In July 1987, LEAHY again entered Long Beach Naval Shipyard for an extensive New Threat Upgrade (NTU) overhaul. NTU significantly increased her combat capabilities against modern aircraft and missile threats. 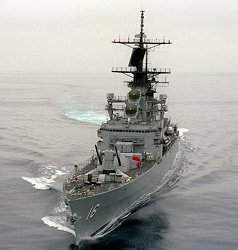 LEAHY was the senior host ship for the Soviet Navy's historic visit to San Diego in August 1990. This was the Soviet Union's first visit to the United States west coast. In July 1992, LEAHY served as Anti-Air Warfare Commander, "Alfa Whiskey", for the multi-national "Rim of the Pacific" (RIMPAC) exercise. RIMPAC culminated with LEAHY successfully firing two SM-2 long range anti-air missiles and one Harpoon anti-ship cruise missile. During LEAHY's eighth and final deployment to the western Pacific, she operated off the coast of Somalia in December 1992 to provide support for U.S. Marine and coalition forces ashore involved in Operation Restore Hope. Functioning as a regional air traffic control center, LEAHY teamed with E-2C Hawkeye aircraft operating from the carrier KITTY HAWK (CV 63) and U.S. Marine air controllers ashore, to safely direct more than 300 military and United Nations relief flights a day into Mogadishu, Somalia. These operations were essential to the safe delivery of food and medical supplies to key relief centers in famine-stricken Somalia. In response to increasing tensions in the Northem Arabian Gulf involving Iraqi violations of United Nations resolutions, LEAHY, in company with KITTY HAWK, was detached on short notice from Somalia and ordered to proceed at flank speed to the Arabian Gulf. As a result, LEAHY was on station in the northern Arabian Gulf when, on January 13, 1993, aircraft from KITTY HAWK teamed with U.S. Air Force and coalition air forces to conduct a successful power projection strike in southern Iraq. 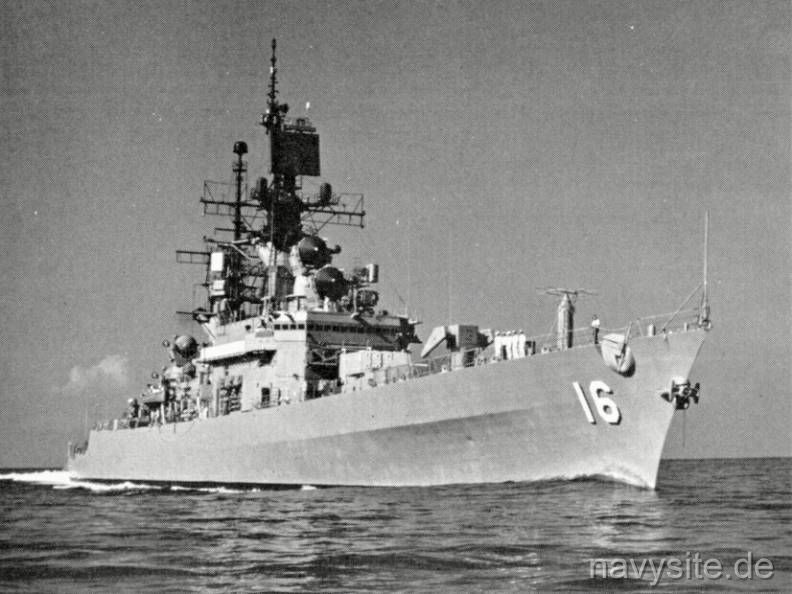 During the return transit to San Diego, LEAHY was awarded the Battle "E" for Commander, Cruiser Destroyer Group Five by Commander, Naval Surface Forces, Pacific. During the two year competitive cycle from January 1, 1991 to December 31, 1992, LEAHY also received mission area excellence awards in Anti-Air Warfare, Anti-Surface Warfare, Anti-Submarine Warfare, Maritime Warfare/Power Projection, Command and Control, Supply, and Engineering/Survivability. Additionally, LEAHY was awarded the Pacific Fleet's Anti-Air Warfare Excellence Award.